When you download an app, you need to accept the permissions it needs access to. For all Android devices on versions prior to Android Marshmallow, ALL permissions have to be accepted. 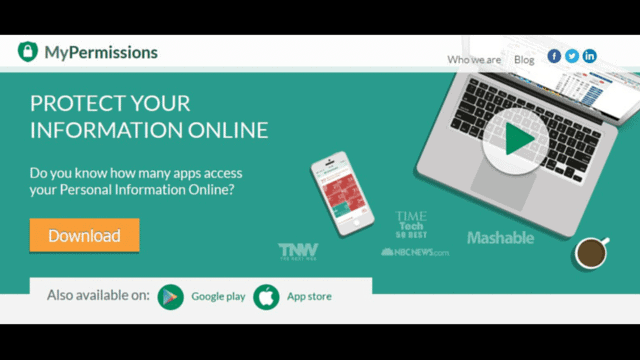 Granting apps and social networks access to your accounts may needlessly expose your data to people who gather it for profit. And so, it may be crucial for you to scour your apps and social media accounts for the kind of data you’ve given over to the companies behind these. Your privacy is at stake. The MyPermissions app takes guarding your privacy a step higher with its more proactive functions. If you’ve allowed Facebook access to your Flickr account, for example, you will be able to revoke it. This is important because you don’t really need to interconnect all your social networks. You can definitely keep your, say, Facebook life separate from your Twitter life. Unless you do, you risk oversharing everything across your audiences. Do you really want that? In order to check your social media accounts for privacy risks and “deadly” interconnections, you must first install the MyPermissions extension. I highly recommend the Google Chrome extension, as the Firefox add-on may not work as seamlessly. After you’ve installed the extension, a scan will start and show you all the app interconnections you’ve allowed on your social networking site of choice. Right after the scan, I was dismayed to see that all the games I haven’t played in years were still on my Facebook account. I also saw that the social media management apps I’ve installed were viewed as “Very High Risk” apps. While that’s pretty alarming, I need those social media management apps, so I’d rather hit “Trust” than disconnect. 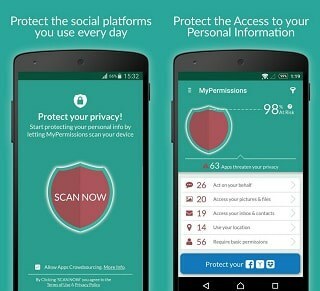 MyPermissions Android app, just like the browser extension, lets you screen through your installed apps and check which functions you’ve permitted. You may either “Trust” or “Uninstall” the app for the Android. Other than that, you can also perform the same social network security check as you were able to on the browser extension. Just log into the particular social network from the app, wait for the “Scanning for [Social Network] apps” dialogue to appear, and then MyPermissions will display its report. Using MyPermissions on a Lollipop HTC initially, I was able to check my Twitter app permissions immediately. I was also able to disconnect one app I didn’t really trust even when I installed it, but kept it because I thought it was useful. Thanks to MyPermissions, I got reminded that it existed in my Twitter account and disconnected it accordingly. The same thing was also true for my Instagram account. While I have not connected so many third-party accounts to my Instagram, I was still able to spot a dubious app that I should have disconnected as soon as I deleted the app itself. Trying the MyPermissions app with my Instagram account via the Android mobile app was easy, straightforward, and definitely helpful. After you log into a social networking account successfully, then the “Scanning for [Social Network] apps” dialogue completes and your privacy risk report is shown, your social networking account will show up in the app’s sidebar, beside the icon showing what’s inside your Android account. This is how you can tell that the process completed perfectly well. Using MyPermissions for Twitter and Instagram via mobile was a whole lot easier than using the browser extension, admittedly. While I’m going to set a whole weekend, sometime, to scour through the apps on my Facebook account, one thing I noticed with the browser extension was that it got stuck on loop in “Disconnecting” the game I was trying to get rid of. I decided to just go back to scanning and disconnecting these apps when I have time, so I didn’t really think it was a bug, at first. Then, I tried connecting my Facebook account to MyPermissions on Mobile. It did not go through the “Scanning for [Social Network] apps” dialogue, at all. I tried it first with my oldest-ever Facebook account with all the apps and games since I joined Facebook in 2007. The “Scanning for [Social Network] apps” dialogue never appeared. Then I tried it with an emptier Facebook account I set up for work, the dialogue never appeared, either. Initially, I did chalk it up to the fact that maybe my Facebook account is simply too bloated for MyPermissions to handle. But when the same issue happened for my other, less populated account, I realized that the issue could lie in the fact that Facebook has been constantly updating its code in the past year, and more so in the recent months. So maybe MyPermissions was unable to keep up with Facebook’s code, for some reason. Later, I again tried “Disconnecting” Mafia Wars from the browser extension’s report, but the dialogue got stuck on “Disconnecting.” Later, when the page was refreshed, Mafia Wars is still part of the list of the privacy-encroaching apps. In short, there’s a bug somewhere, and it’s a pity I’m no developer or mega-geek to be able to explain that. I guess, when I schedule the Facebook app-scouring spree, I could just open the report and then manually delete each game and app from my account, one by one. Given that I’ve accrued hundreds of apps since 2007, good luck to me, then. MyPermissions on iOS has lesser functions compared to the Android versions. While MyPermissions on the Android scours all your installed apps for privacy risks, MyPermissions on iOS only has the social media functions. Unlike with the Android version, MyPermissions for iOS was limited to scanning the Social Media privacy issues. If you can note on this photo comparison, with the Android version on the left, and the iOS version on the right, iOS only shows icons for social media accounts. On the other hand, the Android version shows another icon, the Android icon, which will lead to the apps on the device. It’s a pity that the iOS version is very limited by contrast. And unlike how I hoped, neither did it grant access to Facebook’s app. After logging in with my Facebook credentials, MyPermissions just acted like any Facebook browser, and unlike how it was able to scan Instagram and Twitter efficiently, Facebook on MyPermissions for the iOS did not work as intended, just as it didn’t on the Android. Thus, it’s maybe safe to say that the bug is with the app’s integrations with Facebook, and mostly with Facebook’s code, and not with MyPermissions itself. Indeed, I go back to what I surmised: MyPermissions’ team may have had problems with the changes that Facebook has been rapidly rolling out. Lastly, there’s one more beef that I’ve had with the iOS version: Only the iPhone version was available on the iTunes app store, and since the testing device was an iPad Mini, the app wasn’t optimized for the iPad. Should MyPermissions’ developers want to build a more robust iOS version and gather more users on the iOS, it’s necessary for them to build one for the iPad. There is one behavior that MyPermissions was better on the iOS: It was able to remember logins and authentications better than on Android. On the Android, once you press the back button before the post-login scan completes, and your social network account shows on the Accounts area, you’ll have to log in again. On the iOS, if you happened to hit the Home button or exited the screen in any way, you can still pick up where you left off when you tap on the social network icon. Is MyPermissions a worthy download on the iOS? If you want to check your Twitter and Instagram accounts for privacy and integration issues, yes. You may also do the same for Yahoo!, Google+, and Dropbox. My suggestion for MyPermissions’ team is to add the app scan feature on the iOS, and maybe consider dropping the Facebook function on both platforms, if the integration continues to be buggy. The Marshmallow version brought much-needed functions to the Android ecosystem that users have clamored for in the longest time. One of the direly-needed functions was the capacity to modify or select the permissions allowed for each app. The reason why this was a crucial function is that some apps actually ask for data that they don’t really need to have. An example of an allowed permission that is too invasive for comfort would be the user’s location information, especially when paired with the device’s unique identifier. Such information is too invasive to the end user’s privacy, that a case was filed before the US Federal Trade Commission. The ruling was in favor of the end-users, and the developer was called to give up the data they managed to gather. You may read how to manage permissions on the Samsung Galaxy S7. The process will be very similar to other Android M devices. For the moment, only those on Android M can choose which permissions to grant each app. 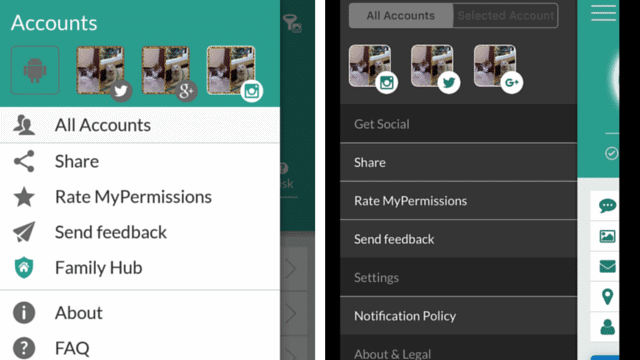 On the whole, MyPermissions could be a great social media account and Android app permissions checker. It shows you whether you’re exposing yourself to privacy and security risks. If only they were able to get their Facebook integration to work properly, and if only the iOS version had the same features as the Android version, and if only it would allow the Android version to modify the permissions and allow partial permissions acceptance, it would have been perfect. As it is, it has degraded to a mediocre app on the iOS, but a good-enough app on the Android. 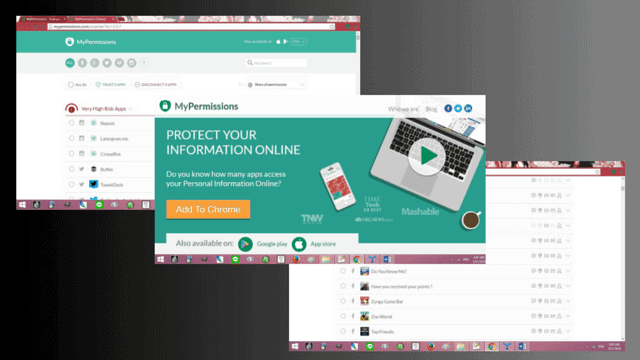 So if you want to check how much you’re exposing to apps and to the social networks, MyPermissions is a one-of-a-kind privacy and security evaluation and protection tool. For the moment, there’s nothing else like it on the app marketplaces.